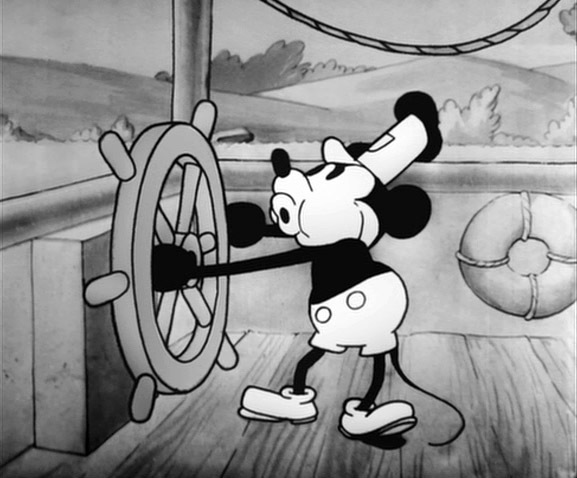 Walt Disney's "Steamboat Willie" was the first to introduced audiences to lip sync sound, sound effects and music in an animated cartoon. Lip sync animation is something that takes a little time to master and their are a variety of books that mention how this is accomplished. Here is a great link to more about the history of sound in animation. For this post, i would like to take you step by step through the process and give you some tips along the way. 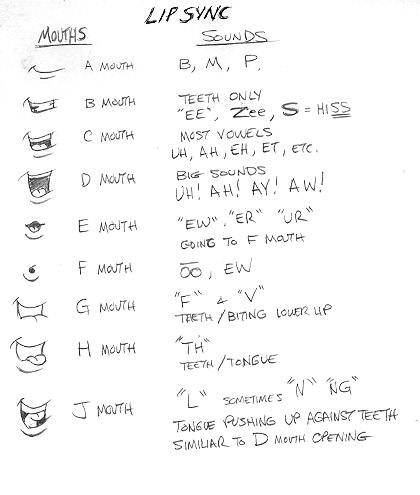 Here's a Lip Sync Chart of the Mouth positions and what sounds each mouth can make. This character's closed mouth would be an "A" mouth, which would be a closed smile with lips, no teeth. 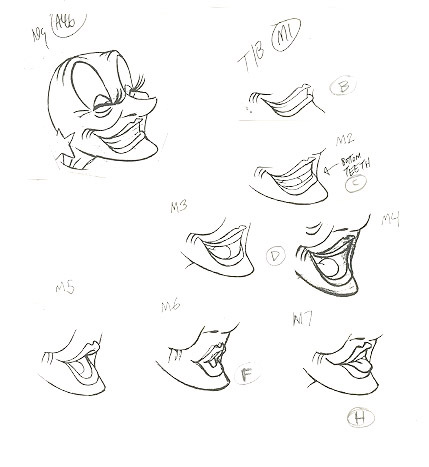 In this scene, the character never used an "A" mouth, since she was always smiling with her teeth. Below you can see her mouth positions. 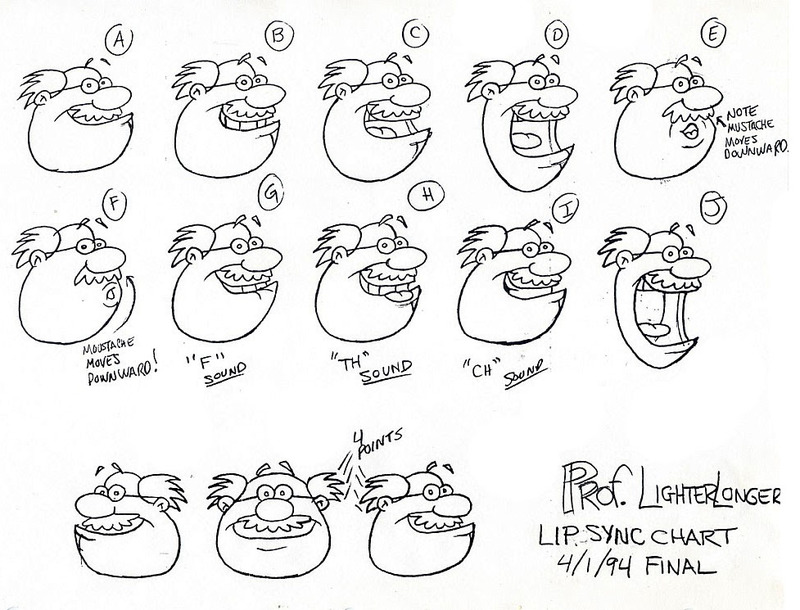 Before you begin reading your sound track, you need to determine your character's mouth positions will work. 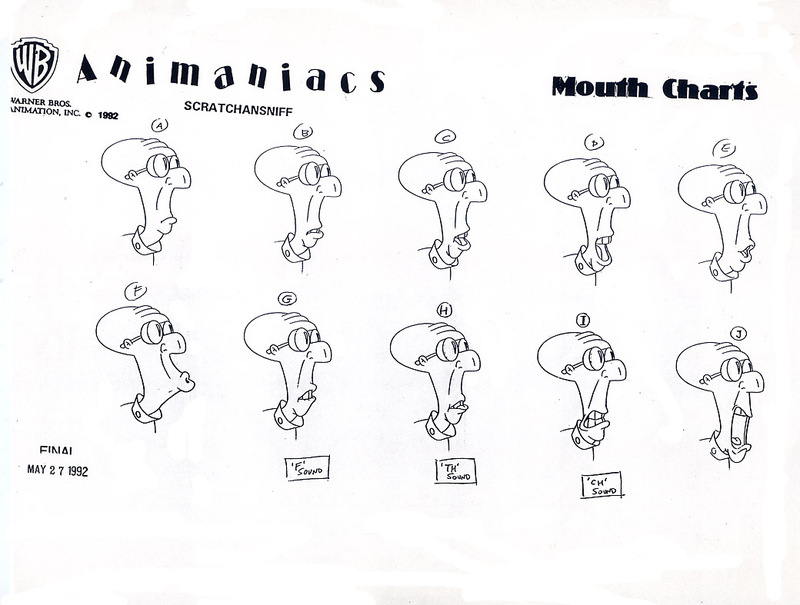 This would be a model sheet showing the various mouth positions. Before you start animating a character, you need to create a series of modelsheets showing the character in various positions, etc. Check this previous post all about modelsheets. 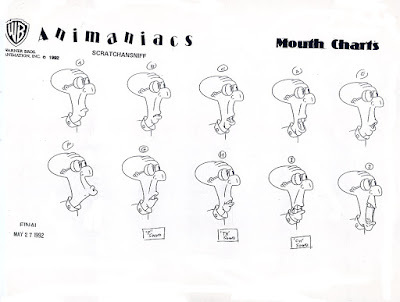 Using the mouth positions modelsheet will help you determine what mouth to animate once you have filled out your X sheet. The mouth positions should have both happy, sad or angry mouths. 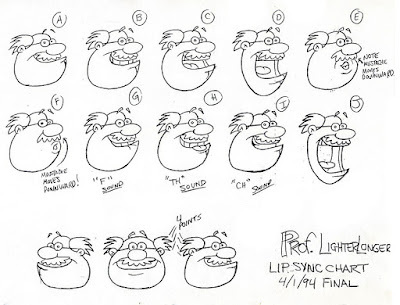 These modelsheets make sure everyone is drawing the character's mouth expression in the same way. I have given a few demos about how to "read" or breakdown a sound track and its like watching someone knit a sweater. By the time I finish showing the process, I ask if there are any questions and no one does. I feel like this something the students need to do on their own, make mistakes and learn from them. Here's a short video explaining the process I use with my Cintiq and laptop for lip syncing a scene from Watchcat. You Learny? You Likey? Then Clicky on the ads or write Commentskis below! Thanks for another great article! I especially liked your table of mouth shapes. The art style you used makes it really easy to understand the essence of what each mouth shape represents. Side note: I can't see the video you mention. I'm currently trying my hand at limited animation, using only the basic mouth shapes without additional in-betweens. The result looks good for the most part, but sometimes there are stretches where I feel forced to use a single mouth shape for a second or so, making the mouth look frozen during that time. What happens is that the dialog contains multiple "EE" vowels (for which I use the B shape). The consonants between these vowels are either clenched-teeth consonants (for which I also use the B shape) or "flexible" ones (for which I use the previous or following mouth shape -- which are also Bs). Do you see a better way for animating cases like these? a pose during these lines. I've learned that its hard to hit a moving target and a slight movement away from stationary position. Adding a gesture that helps sells what is being said will work to. Thank you for your explanation! It makes sense to me that the most elegant approach would be to distract from the static mouth by introducing a different kind of movement. However, since I'm working with some technical limitations, I'll explore your other suggestion of using C for some of the B shapes. Thanks again for your advice! Sparingly using C instead of B works great! It doesn't look "wrong" at all (I was afraid it would), and it keeps the lips busy so they don't appear static. 24 hour contest winners of 2016!